Seventy-four Members of Congress, led by Representatives Brad Sherman (D-CA), Gus M. Bilirakis (R-FL), Carolyn Maloney (D-NY), John Sarbanes (D-MD), Trent Franks (R-AZ), and Mike Pompeo (R-KS), urged the State Department to prioritize the release of two kidnapped Archbishops in a letter to Secretary Kerry today (PDF). 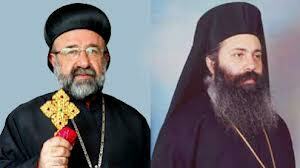 Metropolitan Boulos Yazigi, the Greek Orthodox Archbishop of Aleppo, and Metropolitan Yohanna Ibrahim, the Syriac Archbishop of Aleppo, were abducted by unknown assailants while carrying out humanitarian work in the northern province of Aleppo on April 22, 2013. Their driver, Fatha’Allah Kabboud, a deacon in the Syriac Orthodox Church, was shot dead. “I am pleased that 72 bipartisan Representatives in the House joined together in urging the Secretary of State to make this issue a priority,” said Rep. Sherman, a senior member of the Foreign Affairs Committee and a member of the International Religious Freedom Caucus. “I am deeply concerned for the safety of Metropolitan Boulos Yazigi, the Greek Orthodox Archbishop of Aleppo, and Metropolitan Yohanna Ibrahim, the Syriac Archbishop of Aleppo, who were kidnapped as they carried out humanitarian work near the Turkish border of Syria,” said Rep. Maloney. “We urge the State Department to make Metropolitan Yazigi and Metropolitan Ibrahim’s immediate release and safe return to Aleppo a priority in our efforts in the region,” said the Members in the letter. The full text of the letter can be found on Congressman Sherman’s website or in this PDF file. On April 26 the Assembly of Bishops sent a letter to Secretary Kerry, asking him to work for the immediate release of the Archbishops. That letter can be read here.